With the new season has just come out, I thought this would be a good place to start. The actual town for the making of The Walking Dead’s “Alexandria” is actually called the Gin Property, and is located in Senoia, Georgia. The town itself host several beautiful homes, some which are from the Southern Living home plans. The Monroes’ Home (Mayor of Alexandria) as seen on TWD is located at the left of this townhouse. View of the Monroe’s living room. This is the view as seen from the dining room. The wood floors are very nice, and a lot of detail has gone into the mill work. Note the built ins that surround the two front window seats. This is the kitchen from the Monroe townhouse. Notice that the wood flooring is different than the living room area – with wider rustic planks in a darker stain. They even run in a different direction, almost as if they changed their mind on the style prior to competing this house. This is the house that Michonne lived in during the last season of TWD. And Michonne’s kitchen as viewed from the fireplace above. Again, nice attention to detail is seen in the mill work. Also, notice the morse code chart on the wall to the left. I will be looking for these details in this new season. Jessie and Pete’s house is one of my favorites. I love the wrap around porch and the sky blue exterior. ( The landscaping looks rough on the exterior of these homes, because the production crew required the owners to not maintain it. This lends to the abandoned, end-of-the-world effect). This is the kitchen as seen from the living room looking towards the back door. This house has an open floor plan, and though very nice, it doesn’t have as much detailing as some of the others. Too bad, considering how nice the exterior is. However, the layout could lend to some incredible DIY upgrades. Another popular show that has just released its new season is American Horror Story. Since this article intends to showcase some great horror houses, I certainly couldn’t leave out this series. Plus, they certainly have offered us quite a selection of unique homes to cover. The haunted house from the first season, also known as The Rosenheim Mansion, is one of my favorites. Architect, Alfred Rosenheim had this home built in 1908. It was the focus for the entire first season of American Horror Story, and is referred to as the “Murder House” to AHS fans. The top (feature) image is what the exterior of the house looked like after the production crew finished staging it for filming. However, it is actually quite a beautiful old home with a lot of stunning features. One feature that was displayed throughout the the first season are the mahogany wall panels that run throughout the foyer and stairway. They also line the walls in the mansion’s parlor room. Another stunning feature of the home is the easily recognizable stained glass windows. This is how they look from the interior of the home. The cabinets in the home have tiffany glass doors. Here you can just see one, off to the left, at the top of the landing. The master bedroom of the Rosenheim Mansion has a beautiful bay window area that would be the perfecting place to curl up with a book. You will also notice the original fireplace in this bedroom. It is just one of six fireplaces throughout the house. In the show, this room is shown with wood floors and sheers over the windows. The parlor is where a lot of activity occurred in the T.V. show. The same mahogany detail found throughout the house is also found in this room. Remember the scene where Tate drags Violet into the bathtub after she committed suicide. Well, this is it. Not quite as creepy as the show would have us to believe. In fact, it is quite beautiful, with its old claw footed tub, pedestal sink and marble lined walls. The exterior from season 3, “Coven,” (Miss Robichaux’s Academy for Exceptional Young Ladies) was actually The Buckner Mansion located in New Orleans’ Garden District. (It is a beautiful home that is over 150 years old). However, the interior from the show was created by set designers. The designers did a fabulous job at remaining true to the New Orleans french style. (if you love this style, then you could be Traditional). According to the set designer, they chose a tone-on-tone theme in shades of white, along with strategically placed dark wood accenting. Notice the elaborate crown molding and the wood floors that have an almost white washed appearance. The set for Fiona Goode’s bedroom is just stunning. Again the french style is kept true. It’s too bad that this is not an actual house. However, I am sure this look has been replicated many times. This home was seen in the Twilight series as The Cullen residence, otherwise known as the Hoke House. 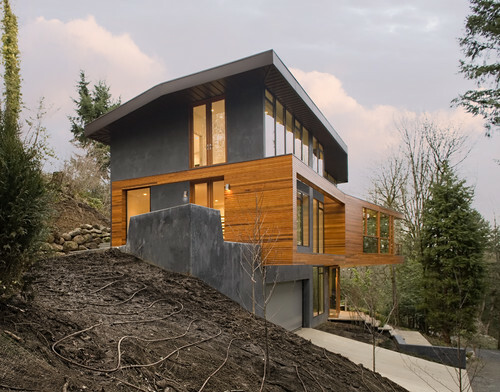 It is a magnificent contemporary structure located in Portland, Oregon. The living room lends a calming effect with its simple Modern style. And the kitchen displays the beautiful clean lines of the Mid Century Modern style. While, adding just a dash of Contemporary, as displayed in the multi level floor and angular features of the island. I Just couldn’t end this article without addressing the new hit series, “Scream Queens.” I, like many other women out there, am in love with Channel’s closet. Although I haven’t been able to confirm it, I imagine that this is a created set for the show. If not, someone is very lucky.